Neutral colors are always a safe choice when it comes to room design! Many homeowners are conflicted when it comes to paint color selection. There are thousands of colors to consider for your home’s interior. You could be bold and consider a couple of vibrant colors for your walls that will add character to your home. On the other hand, you could stick to toned-down neutral colors that also provide several benefits. Many homeowners decide to go the neutral colors route because they are versatile. Some popular colors include eggshell, beige, and shades of gray. 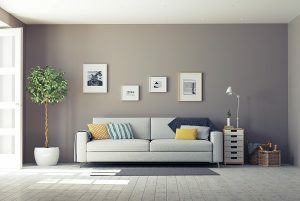 If you are still on the fence about which colors to choose for your next interior painting project, here are a couple major reasons why you may want to stick with neutral colors. Colors go out of style over the years. For example, there were times where shades of rose, teal, and mustard colors were in style. By choosing neutral colors for your home, you can rest assured that these colors will never go out of style. They can provide a home with a timeless look that you can enjoy for years to come. It can be argued that the greatest benefit of neutral colors is that work with practically any style. You have a lot more flexibility in terms of interior design when your walls are eggshell than you do if your walls are painted a dark red.